Only $5 per entry and you can enter as many times as you like! 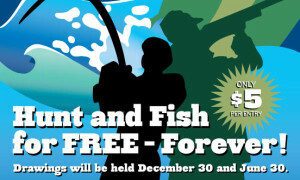 Purchase your entries wherever Texas hunting and fishing licenses are sold. Find a retailer near you or purchase online now! The next drawing will be held on December 30, 2014. Entries will be on sale through December 27, 2014. If you enter before December 27, 2014 and your name isn’t drawn in the December drawing, you will be eligible for the June 30, 2015 drawing. The drawing package also includes a 1-year subscription to Texas Parks & Wildlife magazine. All proceeds from the Lifetime License Drawing fees go directly to the Texas Parks and Wildlife Department for on-the-ground conservation efforts that help make Texas one of the best places in the country to hunt and fish. This entry was posted on Friday, August 22nd, 2014 at 8:48 am	and is filed under News & Updates. You can follow any responses to this entry through the RSS 2.0 feed. Both comments and pings are currently closed.